In less than a decade, a new breed of networked progressive media—from Brave New Films to Talking Points Memo to Feministing and beyond—have informed and engaged millions. By harnessing a participatory media environment, they have succeeded in influencing political campaigns, public debates, and policy making at unprecedented levels. 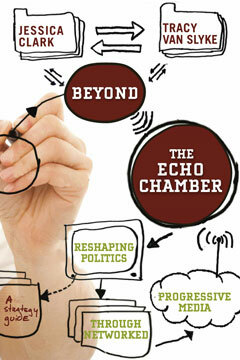 In Beyond the Echo Chamber, media experts Jessica Clark and Tracy Van Slyke tell the story of the recent rise of progressive media and lay out a clear, hard-hitting theory of ongoing impact. A vital strategic guide based on years of research and extensive interviews with key media players and new media experts, Beyond the Echo Chamber will change the national conversation about progressive media and the future of journalism itself. For progressive journalists, bloggers, producers, activists, readers, and policy makers committed to change, here is a first-ever road map to victory.